In addition to C band and Ku band satellite beam coverages, Ka band satellite service is now available for Egypt. Ka band has much more bandwidth than C or Ku band and, using spot beam technology, allows high satellite bit rates at lower cost. Some details of four possible Ka band satellite services, that I know of, are shown below. The first network, called O3b (meaning "Other 3 billion"), is new and unusual. It offers exceptionally high bit rates up to 1.2 Gbit/s and should be attractive to an ISP intending to serve a large local community. Its low orbiting satellites provide low latency which is ideal for voice calls, and sets this network apart from traditional, long range, geostationary satellites. The other three satellite service providers below, use geostationary satellites and offer a full range of services, ranging from the domestic user to major business customers. This system comprises multiple low orbit satellites moving above the equator. A customer earth station site needs two motor driven dishes which adjust their tracking all the time to see two visible satellites. The provision of coverage towards a particular location is a major commitment by O3B and ideally one or few customers close together will buy the entire beam capacity, up to 600 Mbit/s. Ideal for someone wanting a trunking backbone with dedicated high speed and short propagation delay (low latency) for good quality voice calls and quick response to data. 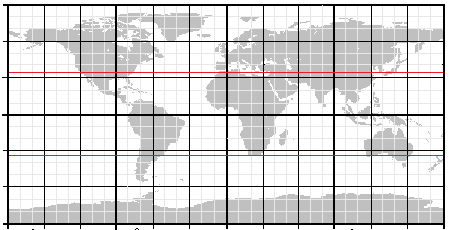 This world map shows coverage limits of +/- 34 deg latitude north and south. The range possible for 24 hour coverage depends on the number of satellites. I believe that 5 satellites, evenly spaced would provide the above range. With a larger number of satellites (e.g 16) operation to +/-45 deg latitude is expected. First 4 satellites were launched 25 June 2013. Height 8064km period 4.8 hours. European geostationary system, at 9 degrees east, provided by Skylogic Italy, with multiple small spot beams. Generally thought of as consumer oriented, offering shared home service at very low cost. Business service is possible with dedicated capacity. Coverage in Egypt involves a spot beam aimed at Cairo. 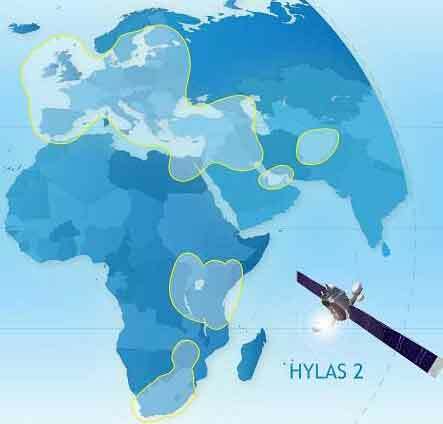 Hylas, based in the UK, has a spot beam covering Egypt, except the south of Egypt, where larger dishes may be possible. Ideal for businesses, hotels or communities. For ISP service talk to them about dedicated trunk service or the possibility of you managing multiple sites in Egypt as a virtual network operator (VNO) local reseller. Page created 13 Nov 2013 ECJ. Amended 13 Feb 2015, 17 Feb 2019.